Every day is Halloween at Moonmaiden, but since we're approaching THE BEST time of the year - what better way to celebrate then to make a super duper spookwah top!!! heheheh<br> <br> I Love this and have worn it loads!!! It has a panelled steamed velvet bodice, with a hook and eye fastening, but it's not a tight top, so nice and comfy! Then mesh off-shoulder upper sleeves with ginormous black mesh cuffs which you can probably tell, I'm totally into at the moment! Hehehehehe!<br> <br> You can see it here in black, worn with our new Steamwitch Skirt! It's available in all of our steamed velvet shades.... gotta wear 'em all, mwahahaha! A gothic classic methinks, and just an all-round awesomely fabulous top. I Love this and have worn it loads!!! It has a panelled steamed velvet bodice, with a hook and eye fastening, but it's not a tight top, so nice and comfy! Then mesh off-shoulder upper sleeves with ginormous black mesh cuffs which you can probably tell, I'm totally into at the moment! Hehehehehe! You can see it here in black, worn with our new Steamwitch Skirt! It's available in all of our steamed velvet shades.... gotta wear 'em all, mwahahaha! 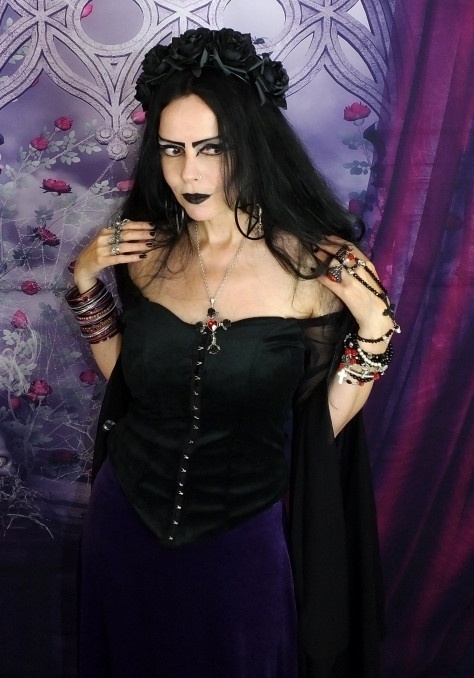 A gothic classic methinks, and just an all-round awesomely fabulous top.